Speaking to reporters Monday, Houston Texans offensive tackle Duane Brown says he will “definitely” play in 2017. Brown has held out of both training camp and preseason in search of a new deal, and is set to miss the team’s opening game against the Jacksonville Jaguars. Over the last seven seasons, Brown has been one of the most consistent tackles in the game, and has graded in the top 20 among offensive tackles each year. His 2016 overall grade of 84.6 ranked 17th of 76 qualifying players at the position. He allowed 28 total pressures on 428 pass blocking snaps in 2016, giving him a pass-blocking efficiency of 95.0 that ranked 27th of 61 offensive tackles with at least 350 pass-blocking snaps. He was one of only two offensive tackles in 2016 with more than 400 pass-blocking snaps and only 1 sack allowed. Brown has been especially good in postseason action. 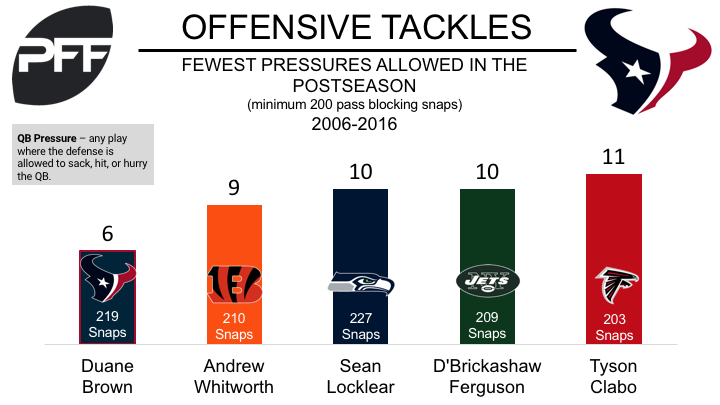 Of the 30 offensive tackles in the PFF era with at least 200 pass-blocking snaps in the postseason, Brown has allowed the fewest pressures (6), ranks first in pass-block efficiency (97.9), and is one of just two players to not allow a sack.